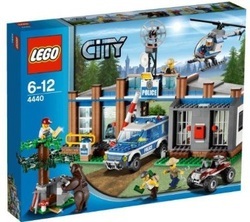 The Lego City Police Forest Station is a great addition for Lego fans, or even for children new to the range, as long as they enjoy construction and building type toys. This Lego toy is designed to promote the development of fine motor skills and encourage a child to use his or her creativity and imagination. If your child has never played with Legos or any other type of building toy, this is a great set to get started with its ton of details to encourage interactive play alone or with another child. It's an especially good set to buy if your child already owns other Lego City toys, as they will complement each other to create a whole town. 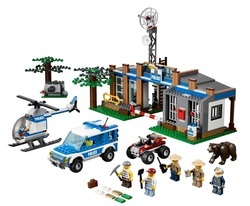 This Lego set is designed to resemble a police station in the forest. The forest policemen catch robbers hiding stolen items behind a rock. The policemen ride around in a helicopter, which is a fun addition. The robbers are arrested and put in the cells. After a while, the robbers try to escape, but there is a large bear lurking nearby. The two sturdy bases in this Lego set make the completely built Lego set more stable discouraging pieces from falling off the design during play. Including minifigures, a helicopter, and an ATV adds a lot more interactive and imaginative play time for your child. The Lego City Police Forest Station is designed for any child to develop his or her fine motor skills, problem-solving skills, and the ability to be creative. The directions to build this Lego set are detailed and easy for a child of six or older to build alone with the explicit detailed pictures that are easy to comprehend. Some stickers are included in this Lego set for more detailed play. The stickers are made of plastic and not paper like other sets. This makes the stickers resist wear and fading over time; however, a younger child may need parental guidance in placing these stickers in the correct places. Overall, the Lego City Police Forest Station offers your child lots to do with different storylines. This set is sure to give your child hours of imaginative play. Lego lives up to its name in durability, and the toy is good value considering what you'll get.